George Gershwin belongs to the category of exceptionally gifted artists, who died young and could not implement a great deal of own plans and ideas. Despite his short life, musical and creative inheritance of Gershwin is significant: he wrote about thirty musicals and operettas for theater and cinema, and was the author of many popular songs, which are well familiar to modern people. Born in 1898 in Brooklyn, New York, in a family of Russian immigrants of Jewish origin, future music genius Jacob Gershowitz was demonstrating his talents and endowment since early childhood. At the age of six he began getting interested in playing piano. For very short period of time George achieved an incredible progress in playing by ear, and left his brother Ira, who was receiving lessons from professional teachers, far behind. The family was rather poor, and, being unable to afford fundamental musical education for George, the parents used the services of cheaper private musicians. At the age 12, George became a student of Charles Hambitzer, who made the strongest influence on Gershwin. Hambitzer trained young George in piano techniques, harmony, orchestration, improvisation, and also made him familiar with music of progressive European composers. Later on, Gershwin was tutored by a number of other famous composers, such as Rubin Goldmark or Joseph Shillinger, who taught him the basics of composition and artistic arrangement. During the first years of his musical career Gershwin was regularly performing at Remick’s Music Publishing House in Tin Pan Alley as a song plugger: a piano player showing the songs to be sold to the producers. This work was an incredible experience for the young composer, and during this period of time he made first efforts on composing some own songs, similar to the ones he had to perform. 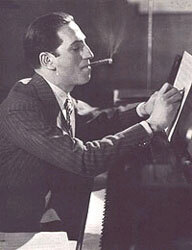 In 1916 he officially published his first composition and signed it up as George Gershwin. For some time he continued earning money as a pianist, working on writing more and more songs and even musical comedies. In 1919 the premier of his first stage musical La, La, Lucille had a great success in Broadway and, a year later, his song from this musical, Swanee, performed by Al Jolson, brought nationwide fame and popularity to young talented composer. Within the first year, Swanee‘s record sales exceeded one million copies sold around the country, and it was just the beginning for Gershwin. Together with his brother, Ira Gershwin, George wrote a great deal of stage musicals and compositions for stage shows and performances of Broadway and other American theaters. The most famous of those are Lady, Be Good (1924), Oh, Kay (1926), Girl Crazy (1930), Strike up the Band (1930), and Of Thee I Sing (1931), which can be characterized with special rhythmic patterns and original intonations. Almost all the musicals of Gershwin brothers were staged and successfully performed. 41 processes generated in 0.214 seconds.